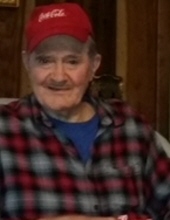 William Robert (Sandy) Kidd, age 83, of Richlands, VA passed away Thursday, November 8, 2018 in Tazewell, VA. He was born October 25, 1935 in Princeton, WV. He was a member of the UMWA. He loved to play music and feed the birds and squirrels. Mr. Kidd was preceded in death by his parents, Harold Otis and Pearl Kidd. He is survived by his loving wife of 56 years, Dorothy Robinette Kidd; four daughters, Angie Kidd of Doran, VA, Tammy Kidd Lester of Rowe, VA, Melissa Blankenship and husband James of Mavisdale, VA, and Fallon Clark of Shortt Gap, VA; two grandsons, David Tyler Blankenship and James William Blankenship; one sister, Shelby Griffith of Richlands, VA; several nieces and nephews also survive. Special thanks to the 4th floor skilled nursing staff at Clinch Valley Medical Center in Richlands, VA. The family will receive friends from 5 – 8 p.m. Sunday, November 11 at Singleton Funeral Service in Cedar Bluff, VA.
Funeral Services will be conducted at 1:00 p.m. Monday, November 12, 2018 at the Singleton Funeral Service Chapel with Bro. Monty Elswick and Bro. Danny Houchins officiating. Burial will follow in the Greenhills Memory Gardens at Claypool Hill, VA. Pallbearers will be David Houchins, Jerry Herron, Phil Reedy, John Reedy, Dean Griffith, and Danny Brown. Online condolences may be sent to the family by going to www.SingletonFuneralService.com. Singleton Funeral Service is serving the family of William Robert (Sandy) Kidd. To send flowers or a remembrance gift to the family of William Robert (Sandy) Kidd, please visit our Tribute Store. "Email Address" would like to share the life celebration of William Robert (Sandy) Kidd. Click on the "link" to go to share a favorite memory or leave a condolence message for the family.